In its latest incarnation, Boca Raton’s Sushi Yama continues an almost twenty year tradition of providing peerless cuisine and impeccable service. The high ceiling interior is an enchanting picture of industrial chic. Behind the elegant sushi bar, tireless chefs work their artistry creating magnificent rolls, scrumptious platters and captivating seafood barques. The current menu incorporates the best of the past, new signature offerings and themes from other Asian sources. Pick of the starters: the luscious Ahi Tuna Salad ($12.95) paired with savory seaweed salad is a delight made even more engaging with a dish of the in-house crafted dressing. Each sliver of the vibrant tuna seemed to melt as soon as you sensed the pristine flavor. Gyoza ($6.50), crescent shaped dumplings filled with pork and vegetables, arrived with just the right degree of crispness and a dish of entrancing gyoza sauce. With these two openers we were on a roll and nothing could be more enticing than one of the houses extraordinary Super Signature Rolls. Fortunately, our host, proprietor Chef Adam, was on hand to hand pick the stellar American Dream Roll ($13.95) which lived up totally to its description. Every masterfully prepared segment contained shrimp tempura, conch, krab, cucumber, lettuce, roe and a topping of satiny avocado. A magnificent eel sauce electrified the entire ensemble. In keeping with the pan Asian theme, our Pad Thai ($12.95) was a truly memorable presentation filled with a savory blend of rice noodles, egg, bean sprouts and peanuts. A glorious rendition of shrimp tempura, Ebi-Ten ($17.50), included gigantic crunchy battered shrimp, sweet potato, zucchini, carrots and other veggies. Our galaxy of gourmet delights called for an equally exceptional saki and none is more fitting than Hana- Kohaku’s Plum Saki, This buoyant, deliciously sweet elixir accompanied us throughout the courses adding the right amount of zest to each nibble. The Love Boat ($50) is a triumph of design, flavor and texture. The colorful barque features two cocktail glasses which function as masts and are filled with cuts of tuna and sculptured vegetables. The deck, fore and aft, contained sushi, rounds of California roll and assorted garnishes. It’s a feast for the eyes and the palate. 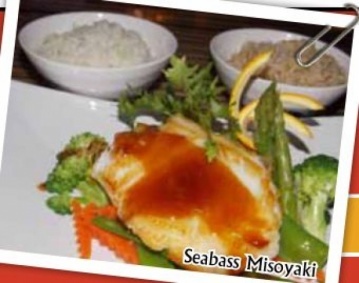 Sea Bass Misoyaki ($17.95) presents a sublimely grilled Chilean sea bass filet anointed with a homemade miso sauce. Steak Teriyaki ($16.95) delivers a fork tender New York strip steak served with a crafted teriyaki sauce. Both are served with crisp vegetables and bowls of tantalizing rice Sushi Yama offers many sweet endings. We opted for the refreshing F.B,I, prepared with scoops of ice cream, fried bananas and whipped cream. Another delicious item is the presence in Palm Beach Gardens of a second Sushi Yama operated by the same staff that generates the world class cuisine of the Boca Raton Sushi Yama.